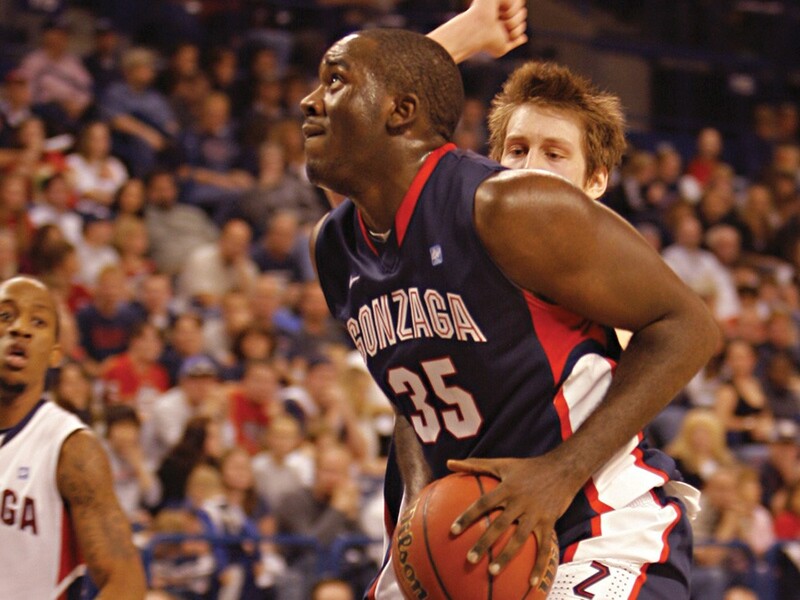 One of Gonzaga's best players may be a late-bloomer fishing for playing time. Sam Dower at this year’s season-opening scrimmage. “He‘s willing to learn to get better,” says teammate Robert Sacre. Gonzaga basketball coach Mark Few prides himself on his fishing skills almost as much as his coaching skills, but he says there’s something fishy about Sam Dower’s claims to being a good fisherman. Dower, Gonzaga’s highly skilled sophomore center, says he leaves his fishing poles back home in Minnesota so he can focus on basketball. That suits Few just fine. The latter statement may come as a surprise to those who don’t follow Gonzaga basketball closely, since Dower backs up senior standout Robert Sacre. Dower averaged just 14 minutes per game off the bench last season, but he averaged 7.6 points (fourth on the team) and 3.3 rebounds (fifth), shot 58 percent from the field (second), and blocked 26 shots (second) in 35 games. Dower’s offensive skills have never been in question (“He certainly doesn’t need to work on his left-handed jumper,” Few says with a smile), but the 6-foot-9-inch, 248-pounder is working to improve the rest of his game. “The thing holding him back last year was his defensive liabilities and some rebounding,” Few says. “He’s shored up some of that and worked on expanding his game a little bit. Sacre says Dower’s biggest improvement since arriving at Gonzaga (he redshirted two years ago) has been on defense. “I’m working hard on that,” Dower says. Dower says he benefits from going up against Sacre regularly in practice. Few calls the 7-foot, 260-pound Sacre “probably the best post defender in the country,” and Dower points out that Sacre’s value to the team extends beyond talent alone. “He shows me his leadership skills,” Dower says. “I can carry those qualities in me after he leaves. Dower, a public-relations major, is quite personable in his own right. He certainly doesn’t have any problem stating Gonzaga’s goals for the year. The 23rd-ranked Bulldogs figure to do just that if Dower can deliver a few more performances like his 27-point effort against San Diego, or his 21-point night against Saint Mary’s. Interestingly, Dower nailed 11 of 12 shots against San Diego just four years after spending the first half of his sophomore season of high school on the junior varsity. By his senior year, Dower had bloomed in spectacular fashion at his suburban Minneapolis school. He turned down scholarship offers from Minnesota, Marquette and Iowa to come to Gonzaga — without his fishing poles. Dower came to Gonzaga to work.